One of my favorite traditions at Christmas time is to make an ornament for each of my children. Originally we purchased ornaments each year, but over the last couple of years I've switched to giving them handmade ornaments, and I don't think I'll ever go back. I love the idea of these little bits of love moving on with my children when they move out and establish homes of their own. 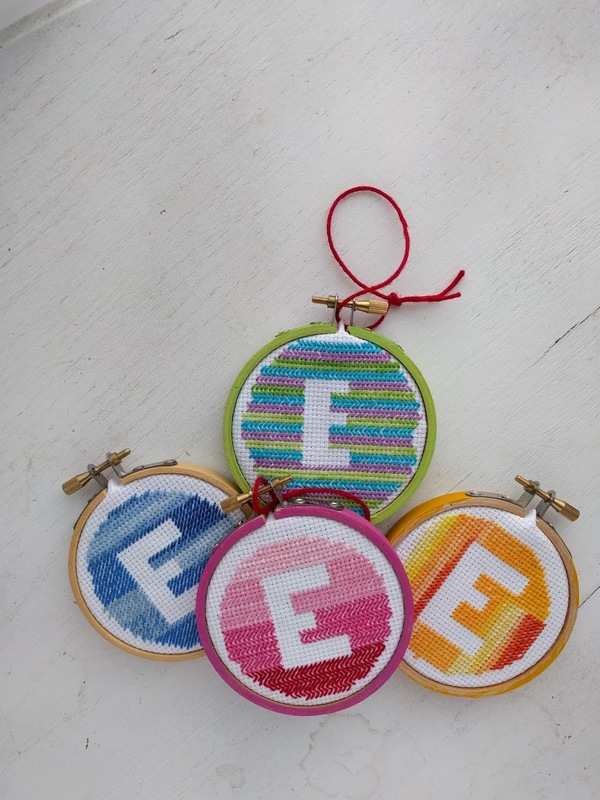 This year I decided to make cross stitch initials. It's a simple project with a beautiful effect. First, cut the cross stitch fabric to size. 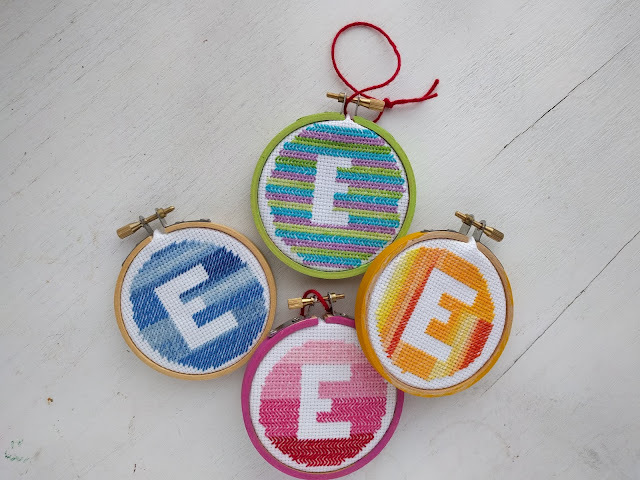 Trace (or freehand) the initial of your loved one onto the fabric, so it's centered in the hoop. Start stitching around the initial, leaving the letter blank. 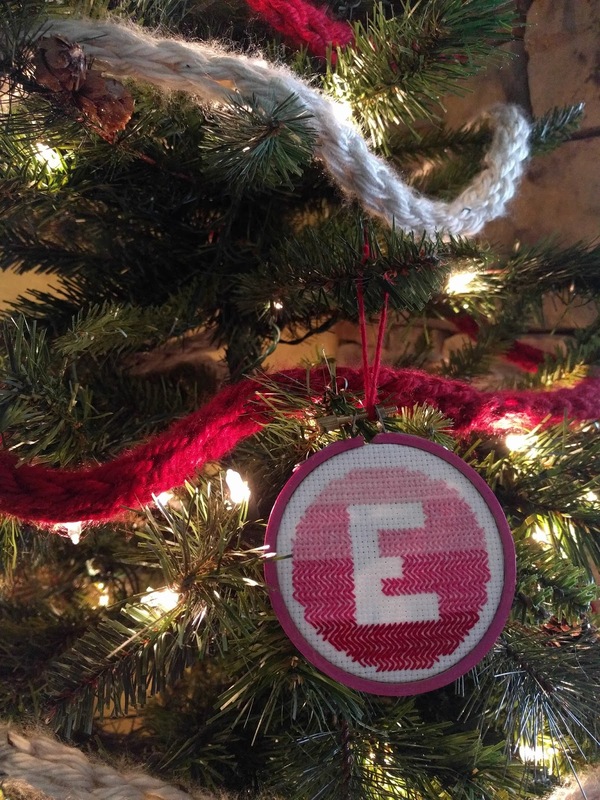 I used half cross stitches both because I had so many ornaments to make and because I liked the look it created. You can do arrows and chevrons and other patterns with half stitches like I did on a couple of the ornaments, or just have every stitch face the same direction like I did with the other two. Keep stitching until the hoop is filled. Paint a harmonious color around the outside ring of the embroidery hoop, or leave it plain. Which ever you prefer or have time for :). Rinse off the water soluble marker and let the cross stitch dry. Return stitching to the hoop. Tie yarn or twine or string around the clasp of the hoop and you're done!